Christology (from Greek Χριστός Khristós and -λογία, -logia) is the field of study within Christian theology which is primarily concerned with the nature and person of Jesus as recorded in the canonical Gospels and the epistles of the New Testament. Primary considerations include the relationship of Jesus' nature and person with the nature and person of God the Father. As such, Christology is concerned with the details of Jesus' ministry, his acts and teachings, to arrive at a clearer understanding of who he is in his person, and his role in salvation. The views of Paul the Apostle provided a major component of the Christology of the Apostolic Age. Paul's central themes included the notion of the pre-existence of Christ and the worship of Christ as Kyrios (Greek: Lord). The pre-existence of Christ became a central theme of Christology. Proponents of Christ's deity argue the Old Testament has many cases of Christophany: "The pre-existence of Christ is further substantiated by the many recorded Christophanies in the Bible." "Christophany" is often considered a more accurate term than the term "theophany" due to the belief that all the visible manifestations of God are in fact the preincarnate Christ. Many argue that the appearances of "the Angel of the Lord" in the Old Testament were the preincarnate Christ. "Many understand the angel of the Lord as a true theophany. From the time of Justin on, the figure has been regarded as the preincarnate Logos." Following the Apostolic Age, the early church engaged in fierce and often politicized debate on many interrelated issues. Christology became a major focus of these debates, and every one of the first seven ecumenical councils addressed Christological issues. The second through fourth of these councils are generally entitled "Christological councils", with the latter three mainly elucidating what was taught in them and condemning incorrect interpretations. The Council of Chalcedon in 451 issued a formulation of the being of Christ — that of two natures, one human and one divine, "united with neither confusion nor division". Chalcedonian Christianity - Eastern Orthodox, Roman Catholic, and many Protestant Christians - continue to advocate this doctrine of the hypostatic union. Due to politically-charged differences in the 4th century, schisms developed, and the first denominations (from the Latin, "to take a new name") formed. In the 13th century, Saint Thomas Aquinas provided the first systematic Christology that consistently resolved a number of the existing issues. In his Christology from above, Aquinas also championed the principle of perfection of Christ's human attributes. The Middle Ages also witnessed the emergence of the "tender image of Jesus" as a friend and a living source of love and comfort, rather than just the Kyrios image. Catholic theologian Karl Rahner sees the purpose of modern Christology as to formulate the Christian belief that "God became man and that God-made-man is the individual Jesus Christ" in a manner that this statement can be understood consistently, without the confusions of past debates and mythologies. Over the centuries, a number of terms and concepts have been developed within the framework of Christology to address the seemingly simple questions: "who was Jesus and what did he do?" A good deal of theological debate has ensued and significant schisms within Christian denominations took place in the process of providing answers to these questions. After the Middle Ages, systematic approaches to Christology were developed. The term "Christology from above" refers to approaches that begin with the divinity and pre-existence of Christ as the Logos (the Word), as expressed in the prologue to the Gospel of John (John 1:1-14). These approaches interpret the works of Christ in terms of his divinity. Christology from above was emphasized in the ancient Church, beginning with Ignatius of Antioch in the second century. The term "Christology from below", on the other hand, refers to approaches that begin with the human aspects and the ministry of Jesus (including the miracles, parables, etc.) and move towards his divinity and the mystery of incarnation. The concept of "Cosmic Christology", first elaborated by Saint Paul, focuses on how the arrival of Jesus as the Son of God forever changed the nature of the cosmos. The terms "functional", "ontological" and "soteriological" have been used to refer to the perspectives that analyze the "works", the "being" and the "salvific" standpoints of Christology. Some essential sub-topics within the field of Christology include the incarnation, the resurrection, and salvation. Early Christians found themselves confronted with a set of new concepts and ideas relating to the life, death, and resurrection of Jesus, as well the notions of salvation and redemption, and had to use a new set of terms, images, and ideas in order to deal with them. The existing terms and structures which were available to them were often insufficient to express these religious concepts, and taken together, these new forms of discourse led to the beginnings of Christology as an attempt to understand, explain, and discuss their understanding of the nature of Christ. Furthermore, as early Christians (following the Great Commission) had to explain their concepts to a new audience which had at times been influenced by Greek philosophy, they had to present arguments that at times resonated with, and at times confronted, the beliefs of that audience. A key example is the Apostle Paul's Areopagus sermon that appears in Acts 17:16-34. Here, the apostle attempted to convey the underlying concepts about Christ to a Greek audience, and the sermon illustrates some key elements of future Christological discourses that were first brought forward by Paul. The Kyrios title for Jesus is central to the development of New Testament Christology, for the early Christians placed it at the center of their understanding, and from that center attempted to understand the other issues related to the Christian mysteries. The question of the deity of Christ in the New Testament is inherently related to the Kyrios title of Jesus used in the early Christian writings and its implications for the absolute lordship of Jesus. In early Christian belief, the concept of Kyrios included the pre-existence of Christ, for they believed if Christ is one with God, he must have been united with God from the very beginning. In everyday Aramaic, Mari was a very respectful form of polite address, which means more than just "Teacher" and was somewhat similar to Rabbi. In Greek, this has at times been translated as Kyrios. While the term Mari expressed the relationship between Jesus and his disciples during his life, the Greek Kyrios came to represent his lordship over the world. No writings were left by Jesus, and the study of the various Christologies of the Apostolic Age is based on early Christian documents. The Gospels provide episodes from the life of Jesus and some of his works, but the authors of the New Testament show little interest in an absolute chronology of Jesus or in synchronizing the episodes of his life, and as in John 21:25, the Gospels do not claim to be an exhaustive list of his works. Christologies that can be gleaned from the three Synoptic Gospels generally emphasize the humanity of Jesus, his sayings, his parables, and his miracles. The Gospel of John provides a different perspective that focuses on his divinity. The first 14 verses of the Gospel of John are devoted to the divinity of Jesus as the Logos, usually translated as "Word", along with his pre-existence, and they emphasize the cosmic significance of Christ, e.g. John 1:3: "All things were made through him, and without him was not any thing made that was made." In the context of these verses, the Word made flesh is identical with the Word who was in the beginning with God, being exegetically equated with Jesus. A foremost contribution to the Christology of the Apostolic Age is that of Paul. The central Christology of Paul conveys the notion of Christ's pre-existence and the identification of Christ as Kyrios. The Pauline epistles use Kyrios to identify Jesus almost 230 times, and express the theme that the true mark of a Christian is the confession of Jesus as the true Lord. Paul viewed the superiority of the Christian revelation over all other divine manifestations as a consequence of the fact that Christ is the Son of God. The Pauline epistles also advanced the "cosmic Christology" later developed in the fourth gospel, elaborating the cosmic implications of Jesus' existence as the Son of God, as in 2 Corinthians 5:17: "Therefore, if anyone is in Christ, he is a new creation. The old has passed away; behold, the new has come." Also, in Colossians 1:15: "He is the image of the invisible God, the firstborn of all creation." 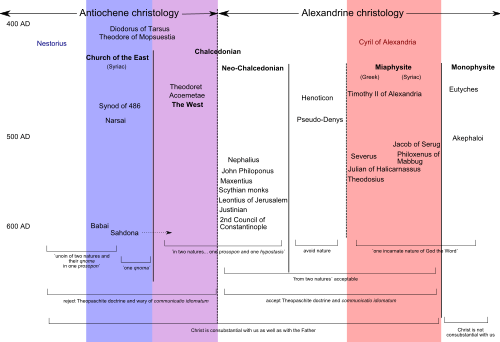 Christological spectrum during the 5th-7th centuries showing the views of The Church of the East (light blue), Miaphysite (pink) and the western churches i.e. Eastern Orthodox and Catholic (light purple). Following the Apostolic Age, from the second century onwards, a number of controversies developed about how the human and divine are related within the person of Jesus. As of the second century, a number of different and opposing approaches developed among various groups. For example, Arianism did not endorse divinity, Ebionism argued Jesus was an ordinary mortal, while Gnosticism held docetic views which argued Christ was a spiritual being who only appeared to have a physical body. The resulting tensions led to schisms within the church in the second and third centuries, and ecumenical councils were convened in the fourth and fifth centuries to deal with the issues. Eventually, by the Ecumenical Council of Chalcedon in 451, the Hypostatic union was decreed—the proposition that Christ has one human nature [physis] and one divine nature [physis], united with neither confusion nor division—making this part of the creed of orthodox Christianity. Although some of the debates may seem to various modern students to be over a theological iota, they took place in controversial political circumstances, reflecting the relations of temporal powers and divine authority, and certainly resulted in schisms, among others what separated the Church of the East from the Church of the Roman Empire. In 325, the First Council of Nicaea defined the persons of the Godhead and their relationship with one another, decisions which were re-ratified at the First Council of Constantinople in 381. The language used was that the one God exists in three persons (Father, Son, and Holy Spirit); in particular, it was affirmed that the Son was homoousios (of the same being) as the Father. The Nicene Creed declared the full divinity and full humanity of Jesus. The Council of Ephesus debated hypostasis (coexisting natures) versus monophysitism (only one nature) versus miaphysitism (two natures united as one) versus Nestorianism (disunion of two natures). From the Christological viewpoint, the council adopted hypostasis, i.e. coexisting natures, but its language was less definitive than the 451 Council of Chalcedon. The Oriental Orthodox rejected this and subsequent councils and to date consider themselves to be miaphysite. By contrast, Roman Catholics to date (and most Protestants) believe in the hypostatic union and the Trinity. The council also confirmed the Theotokos title and excommunicated Nestorius. 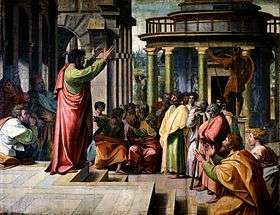 The 451 Council of Chalcedon was highly influential and marked a key turning point in the Christological debates that broke apart the church of the Eastern Roman Empire in the fifth century. It is the last council which many Anglicans and most Protestants consider ecumenical. It fully promulgated the hypostatic union, stating the human and divine natures of Christ coexist, yet each is distinct and complete. Although, the Chalcedonian Creed did not put an end to all Christological debate, it did clarify the terms used and became a point of reference for many future Christologies. Most of the major branches of Christianity — Roman Catholicism, Eastern Orthodoxy, Anglicanism, Lutheranism, and Reformed — subscribe to the Chalcedonian Christological formulation, while many branches of Eastern Christianity - Syrian Orthodoxy, Assyrian Church, Coptic Orthodoxy, Ethiopian Orthodoxy, and Armenian Apostolicism - reject it. The Person of Christ refers to the study of the human and divine natures of Jesus Christ as they coexist within one person. There are no direct discussions in the New Testament regarding the dual nature of the Person of Christ as both divine and human. Hence, since the early days of Christianity, theologians have debated various approaches to the understanding of these natures, at times resulting in schisms. Historically in the Alexandrian school of thought (fashioned on the Gospel of John), Jesus Christ is the eternal Logos who already possesses unity with the Father before the act of Incarnation. In contrast, the Antiochian school views Christ as a single, unified human person apart from his relationship to the divine. The study of the Person of Christ continued into the 20th century, with modern theologians such as Karl Rahner and Hans von Balthasar. Rahner pointed out the coincidence between the Person of Christ and the Word of God, referring to Mark 8:38 and Luke 9:26 which state whoever is ashamed of the words of Jesus is ashamed of the Lord himself. Balthasar argued the union of the human and divine natures of Christ was achieved not by the "absorption" of human attributes, but by their "assumption". Thus, in his view, the divine nature of Christ was not affected by the human attributes and remained forever divine. The threefold office (Latin munus triplex) of Jesus Christ is a Christian doctrine based upon the teachings of the Old Testament. It was described by Eusebius and more fully developed by John Calvin. It states that Jesus Christ performed three functions (or "offices") in his earthly ministry - those of prophet (Deuteronomy 18:14-22), priest (Psalm 110:1-4), and king (Psalm 2). In the Old Testament, the appointment of someone to any of these three positions could be indicated by anointing him or her by pouring oil over the head. Thus, the term messiah, meaning "anointed one", is associated with the concept of the threefold office. While the office of king is that most frequently associated with the Messiah, the role of Jesus as priest is also prominent in the New Testament, being most fully explained in chapters 7 to 10 of the Book of Hebrews. Some Christians, notably Roman Catholics, view Mariology as a key component of Christology. In this view, not only is Mariology a logical and necessary consequence of Christology, but without it, Christology is incomplete, since the figure of Mary contributes to a fuller understanding of who Christ is and what he did. ↑ Compare: Ramm, Bernard L. (1993). "Christology at the Center". An Evangelical Christology: Ecumenic and Historic. Regent College Publishing. p. 15. ISBN 9781573830089. Retrieved 2016-05-09. Christology is the reflective and systematic study of the person and work of Jesus Christ. ↑ Compare: Grillmeier, Alois (1975). "Jesus Christ: III. Christology". In Rahner, Karl. Encyclopedia of Theology: A Concise Sacramentum Mundi (reprint ed.). A&C Black. p. 755. ISBN 9780860120063. Retrieved 2016-05-09. The most urgent task of a contemporary Christology is to formulate the Church's dogma - 'God became man and that God-made-man is the individual Jesus Christ' - in such a way that the true meaning of these statements can be understood, and all trace of a mythology impossible to accept nowadays is excluded. ↑ "Mariology Is Christology", in Vittorio Messori, The Mary Hypothesis, Rome: 2005. ↑ Walter A. Elwell, Evangelical Dictionary of Theology: Second Edition (Grand Rapids, MI: Baker Academic, 2001), 736. ↑ Erwin Fahlbusch et al., “Mariology,” The Encyclopedia of Christianity (Grand Rapids, MI; Leiden, Netherlands: Wm. B. Eerdmans; Brill, 1999–2003), 409. Ehrman, Bart. How Jesus Became God: The Exaltation of a Jewish Preacher from Galilee. HarperOne, USA. 2014. ISBN 978-0-06-177818-6. Murphy, Francsca Aran (ed. ), The Oxford Handbook of Christology, New York: Oxford University Press 2015.